JLS’ aesthetic is built upon a thorough knowledge of tailoring (he worked on Sevile Row) so his cuts and shapes are sharp. The John lawrence sullivan 2015-16 AW collection shown at Tokyo Fashion Week is a take on retro-futurism with some of the best looks the designer has punched out. In fact, there are many materials here that look like they were picked up from a retro “house of tomorrow”. The fur rug, the orange lampshade, the tweed curtains, the buttery soft leather brown couch… but the cerulean blue and zippy orange together are truly a modern element for today-tomorrow..
Futurism is only great when it comes with some warmth-after all, we are wearing these items on our body and not dressing up our robot avatars (yet). For this, bits of retro familiarity make the best partner. There’s two kinds: retro-futurism is fashion set in the late 50s/60s and with avantgarde bits of futurism set in. Meanwhile, there is JLS’ style which is a sleek modern look that adds in accents of the retro-futuristic style. It’s basically Modern-Retroism. The result is something that looks futuristic, and John Lawrence Sullivan is mastering this. 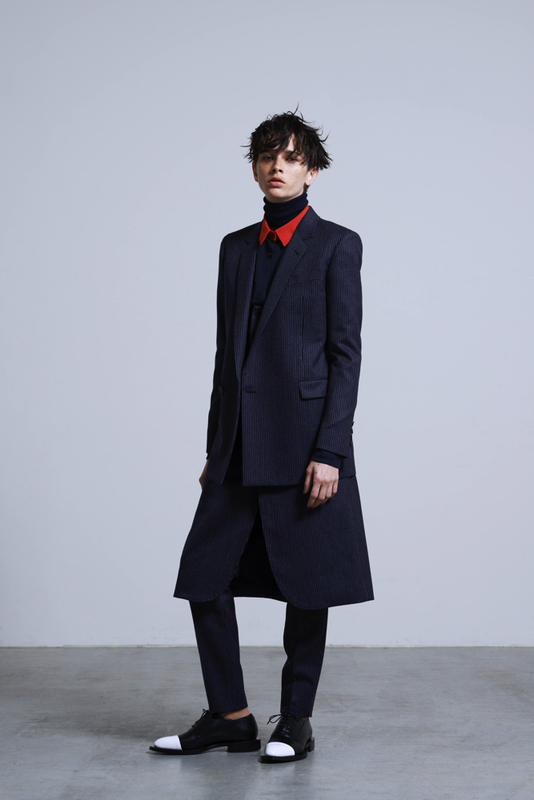 Check out the mens and womens lookbooks of John lawrence sullivan 2015-16 AW. POINT: Check out the neck-line styling on the mens’ side. It appears some of the looks have 4 or 5 layers around the neck, and don’t peek out anywhere else. ポイント2、ママのセーターは神聖なるもの。 POINT2: That mummy sweater is divine for men OR women. A look at the John lawrence sullivan 2015-16 AW mens and womenswear show, held during Tokyo Fashion Week. Exclusive photos by Mami Tanabe.